equipped with the latest machinery. Paul's Locksmiths - Servicing Sydney CBD since 1972. When security matters, choose between our extensive range of brands that include KABA & Lockwood. We’re the number one choice for many offices and strata management services across Sydney. 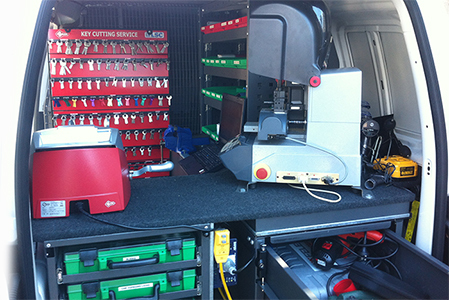 Our mobile locksmiths are available 24/7 and can be called out to any area in Sydney. We provide some of the cheapest quotes in Sydney and have a very loyal customer base. We guarantee outstanding products and personalised service with our full range of security products; from repairing or replacing all kinds of locks and keys, re-keying, master keys, safes, access control, automotive lockouts and more. Paul’s Locksmiths was established over 40 years ago in 1972. During this time we have served the Sydney area with our team of quality locksmith professionals. When it comes to locks and keys, Paul’s Locksmiths is the best in the business. We’ll help you get back in to your property, or secure your premises to keep others out, quickly, reliably, and always at a competitive rate. Having your locks and keys repaired or replaced by our specially trained professionals means peace of mind. Our mobile service means we can get to you quickly, offering a personal service and quality products, whatever your need. We specialise in getting people back into their home, office, premises, storage facility or car, and also in the replacement and installation of all types of locks, keys and access controls when people move from one property to another. We also offer a variety of safes and can recommend, supply and install a range of protective locking mechanisms to meet all types of security requirements. Our home base is in Rozelle, but our mobile service means we can easily work within a 20km radius including the City, Balmain, Leichhardt, Five Dock, Abbotsford, Drummoyne, Breakfast Point, Cabarita, Burwood, Croydon, Concord West, Rhodes, Strathfield, Newington, Homebush, Ryde and surrounding suburbs. Along with our “can do” attitude, we value trust above all else. That’s why we’re the Number One choice for many Real Estate/Strata Agents in the area who appreciate a rapid response and outstanding quality service time and time again.